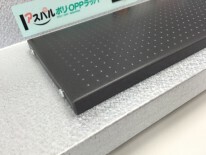 ・ Features sturdy, durable and corrosion resistant zinc aluminum coated steel plate. ・ An energy-saving product that offers accurate temperature adjustment with built-in electronic thermostat (the hot plate will not be engaged when the temperature is set to 0). 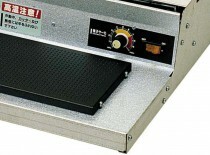 ・Features a hot plate that is finished in a special embossed coating, making it easy to keep the product clean and hygienic! ・A tremendously popular product for food plating & packaging at various convenience stores and food processing factories. 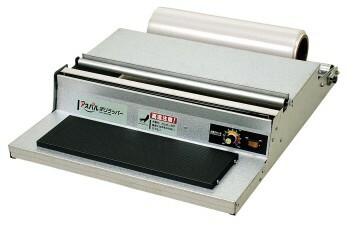 ・The renowned hand wrapper has a long history since its launch in 1968. The model for easy replacement of plastic films. 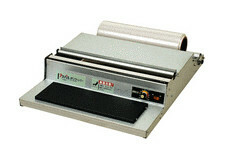 It is possible to keep a stretch film clean by installing inside the body. The model that houses plastic wrap within. Keeps your plastic wrap clean and dirt free, no matter where you use it! 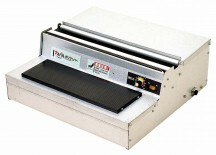 This energy-saving plastic wrap machine operates at merely 165W to be truly eco-friendly. The product features a hot plate that is finished in a special embossed coating, making it easy to keep the product clean and hygienic! Resistant against corrosion and durable for lasting use. The parts are connected by plug which is easy to replace. All you need is one screwdriver when you need to change the parts.